This is the second time I've tried to make profiteroles. The first time was around two and a half years ago and they were a disaster. Somehow I managed to make 2.5cm (1 inch) rounds that were completely solid. They were like little rocks. I have no idea what went wrong but from then on I was too nervous to try again. I've grown up since then and conquered many of my bizarre fears; I no longer duck and cover when a magpie even glances my way, I've learnt that duck bites don't actually hurt, I finally believe that the sea can only rise so much during high tide, and, most recently, that profiteroles aren't out to get me. In fact, profiteroles are quite easy. Except my pastry cream was a disaster, you can't have everything I suppose. It tasted good, so that's a plus one but it was a weird consistency so that's a minus one. No one cared though, I took these to my friends house as an after dinner snack and all sixteen of them and they were gone in the blink of an eye. It feels good to see a plate cleared completely, they even ate the caramel that had stuck to the plate! This recipe was a bit unclear to follow, Gourmet Traveller sometimes formats their recipes a bit funny. I've reworked it a bit so that all the mistakes I almost made don't happen to you. There's nothing more infuriating than getting halfway through a recipe, realising you have 100gm of sugar that you haven't used yet, and not having a clue what to do with it. It just causes freak-outs and freak-outs are best avoided. Combine the milk, lemon juice, and lemon rind in a saucepan and bring to just below the boil. Remove from heat and stand for 15 minutes to infuse. Combine the egg yolks and sugar and whisk for 2-3 minutes, add the cornflour and whisk to combine. Return milk mixture to the heat, bring to just below the boil and strain over the egg mixture. Whisk to combine, then return the mixture to the pan. Whisk mixture of medium heat for 3-4 minutes, or until thick and smooth. Transfer to a bowl and cover closely with plastic wrap, cool to room temperature then refrigerate until cold. When completely cold, whisk to break up slightly, add the cream and whisk until thick and smooth. Refrigerate until required. Spoon mixture into a piping bag fitted with a large 1cm (1/2 inch) nozzle. Pipe 5cm-diameter mounds about 4cm high on the paper-lined oven tray. Bake for 15 minutes, then reduce heat to 180°C (350°F) for another five minutes. Remove from oven and carefully transfer to a wire rack. Cool to room temperature. Whist the caramel is cooking, spoon cooled lemon cream into a piping bag fitted with a 0.5cm (1/4 inch) round nozzle. 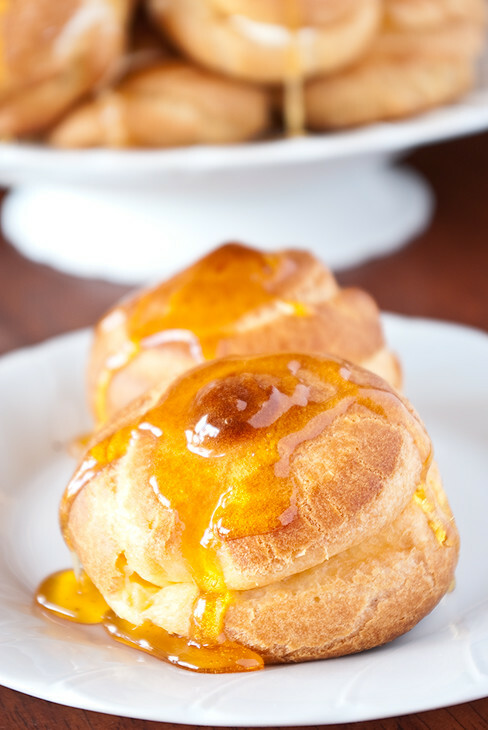 Pipe lemon cream into choux puffs and place on a plate or return to the wire racks. 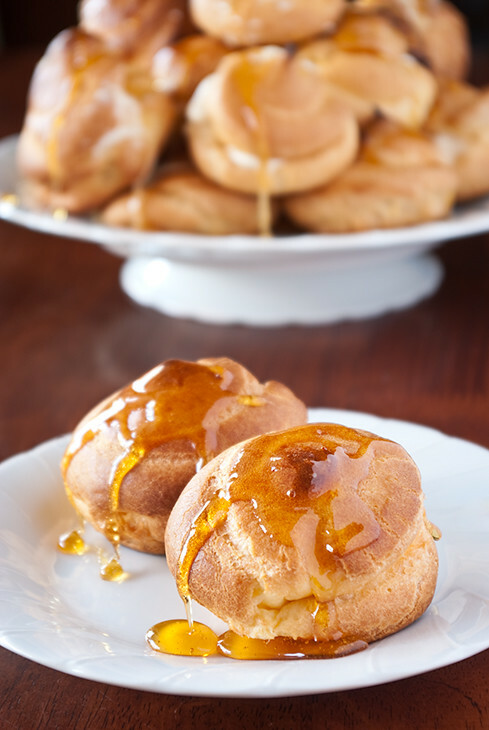 Once the caramel is cooked, careful dip the tops of the profiteroles in it and arrange the finished arrange profiteroles on a plate. Serve fresh. It all changed when I used Donna Hay's recipe - they were beautiful and tasted great, too. I had a profiterole revelation when I tried a Cook's Illustrated recipe - these look totally decadent. Also, still scared of geese. I just discovered your blogspot.. yummy recipes! I'm going to try this one! What camera do you use by the way? I just love how you captured the food! ovenhaven: I'd definitely say the lemon caramel was my favourite bit out of those two options! Patricia: I'll have the try the Donna Hay one next, is it the same one she uses for eclairs? Liz: I hope yours came out wonderfully!